Marimekko is a design house celebrated worldwide for its original prints and colours and creates clothing and accessories for both men and women in addition to home decor. With Big Apple Buddy’s personal shopping service, you can now buy direct from the USA Marimekko online store anytime, anywhere. The Marimekko Onanda dress exemplifies just one of the many unique and fashionable patterns available at Marimekko. This dress is made of viscose crepe and has a straight cut that flares towards the below-knee hemline. It is lined and has a high waistline seam. The fun “small stones” pattern is a great addition to any woman’s wardrobe and its black and white colors make it easy to match with any shoes or accessories! You’ll instantly stand out in this bold and fun pattern! 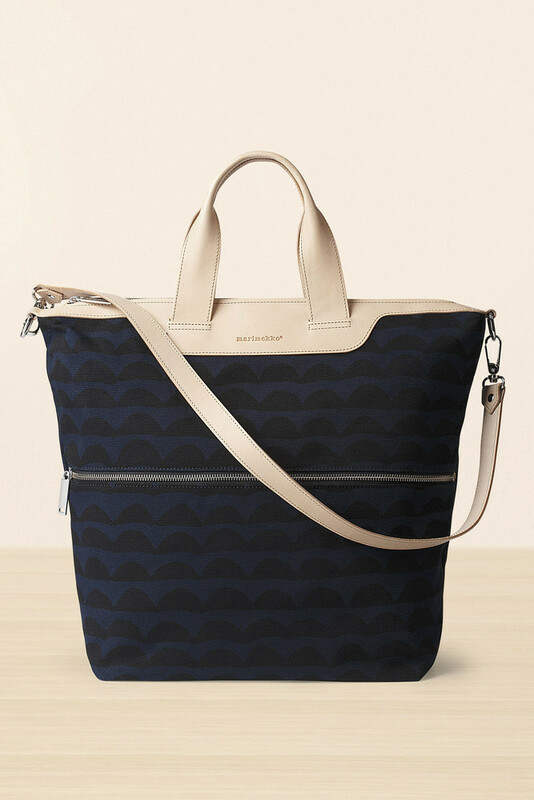 Marimekko also has plenty of fashionable bags and accessories to shop from, including the Marimekko Riikka Bag. This leather trim shoulder bag has a cotton canvas and features their “Iso Papajo” pattern, which is a subtle black print on a navy background. The print is subtle enough that it won’t clash with any other patterns you might be wearing, but still noticeable enough that it stands out even on its own! This bag also has one large exterior pocket and three interior pockets, so it will hold all of your everyday essentials plus a little bit extra. The size and fun pattern of this bag will make it your new favorite accessory! The Marimekko Rhonda Coat is another example of the fun, classy prints that Marimekko is so well known for. 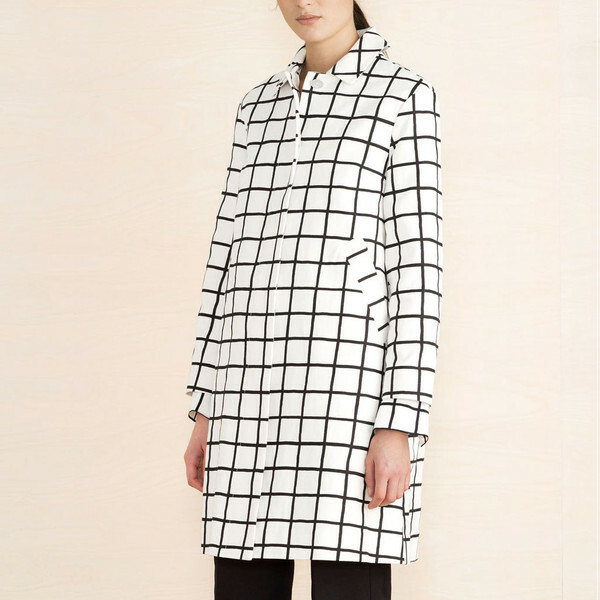 This lined heavyweight cotton coat features a striking black grid-like pattern on a plain white background. It has a relaxed fit and slightly flares to the above-knee hemline. Since this is a longer and more heavyweight coat, it is ideal for colder temperatures and will keep you both warm and stylish. This pattern will bring some instant life and flair to an otherwise neutral outfit and is a great staple piece to have in your closet! Unfortunately, the USA Marimekko online store does not currently offer international shipping. However, Big Apple Buddy, your personal shopper, can help you buy products direct from the official USA Marimekko online store and ship them to your doorstep, no matter where you are in the world. If you would like to buy from the USA Marimekko online store, simply let us know which items you would like to order (by filling out the form below) and we’ll get back to you with a free international shipping quote within 24 hours!